The new year kicked off with a handful of positive market dynamics as sales in both the condo and co-op market saw annual growth. 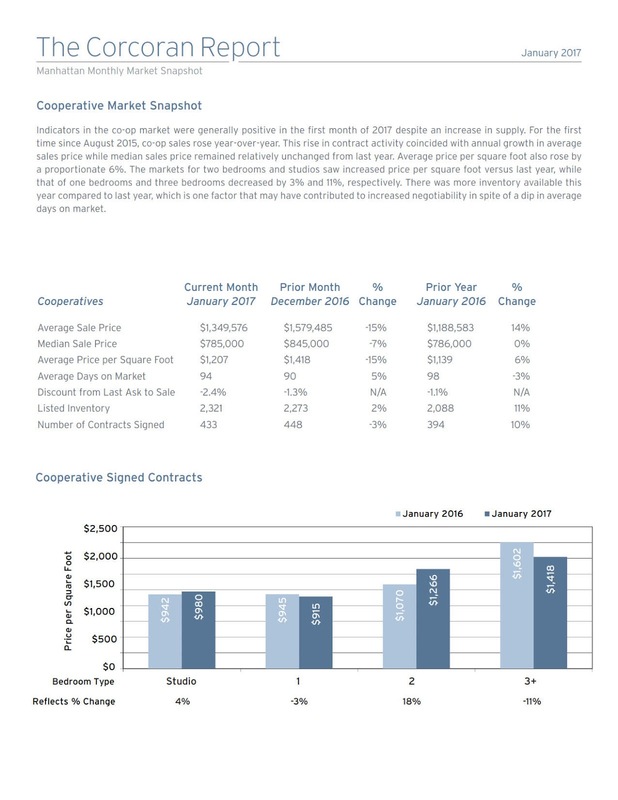 The co-op market saw better metrics, including year-over-year improvements in average price and average price per square foot, growing by 14% and 6%, respectively. In the condo market, by contrast, average price, median price, and average price per square foot were down compared to last year. Total inventory rose versus January 2016 for both condos and co-ops, while negotiability also grew more pronounced over the same period of time. Listings in the co-op market sold faster than in the condo market, in which average days on market grew 37% compared to last year. For the second consecutive month, condo sales grew by double digits year-over-year. Average and median sale price, on the other hand, both decreased compared to last year, by 19% and 11%, respectively. In line with those statistics, average price per square foot was also down 19%, anchored by a steep decline of 35% in the three bedroom market. Last year’s average price per square foot, however, was unusually high due to sales at the Puck Penthouses and the Baccarat, rendering this month’s average price per square foot more in line with historical norms. Adhering to a trend seen throughout 2016, days on market increased sharply versus last year, by 37%. There was also more negotiability this year than last, again favoring the buyer. Inventory was flat with December 2016, but grew 14% from the supply last January. 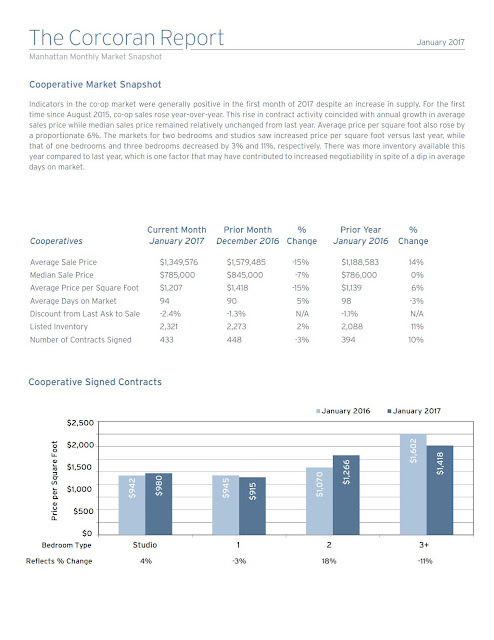 Indicators in the co-op market were generally positive in the first month of 2017 despite an increase in supply. For the first time since August 2015, co-op sales rose year-over-year. 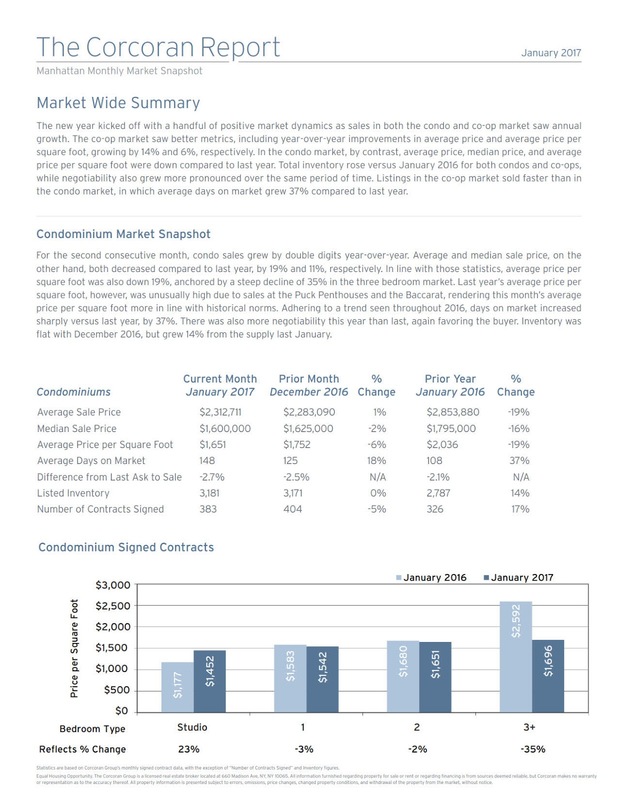 This rise in contract activity coincided with annual growth in average sales price while median sales price remained relatively unchanged from last year. Average price per square foot also rose by a proportionate 6%. The markets for two bedrooms and studios saw increased price per square foot versus last year, while that of one bedrooms and three bedrooms decreased by 3% and 11%, respectively. There was more inventory available this year compared to last year, which is one factor that may have contributed to increased negotiability in spite of a dip in average days on market. 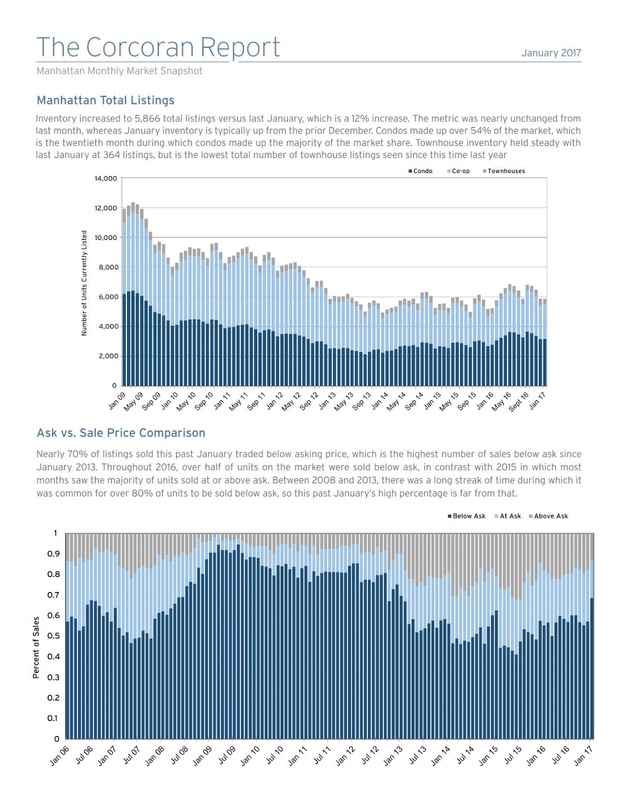 Nearly 70% of listings sold this past January traded below asking price, which is the highest number of sales below ask since January 2013. Throughout 2016, over half of units on the market were sold below ask, in contrast with 2015 in which most months saw the majority of units sold at or above ask. Between 2008 and 2013, there was a long streak of time during which it was common for over 80% of units to be sold below ask, so this past January’s high percentage is far from that. Please do not hesitate to reach out to me if you have any questions about The Report or the Manhattan market in general. I welcome the opportunity to be of assistance to you.